How does one’s view of history affect… well… pretty much everything? But the American way of looking at the world is not the only way. People picture history different ways. Here are a few of them. 2. Linear. Often the Judeo-Christian viewpoint has been seen as the source of the linear view of history. Things change and transition from a beginning, to a middle, and eventually to an end. Related to this would be a progressive viewpoint (the world is getting better) and a regressive viewpoint (the world is getting worse). 3. A combination of the circular and the linear could result in a helical structure. The world (clearly) undergoes important cycles but there are long-term changes that are linear. One could add a progressive or regressive slant to the helix to show the feeling that there is still a trending towards the better or worse. 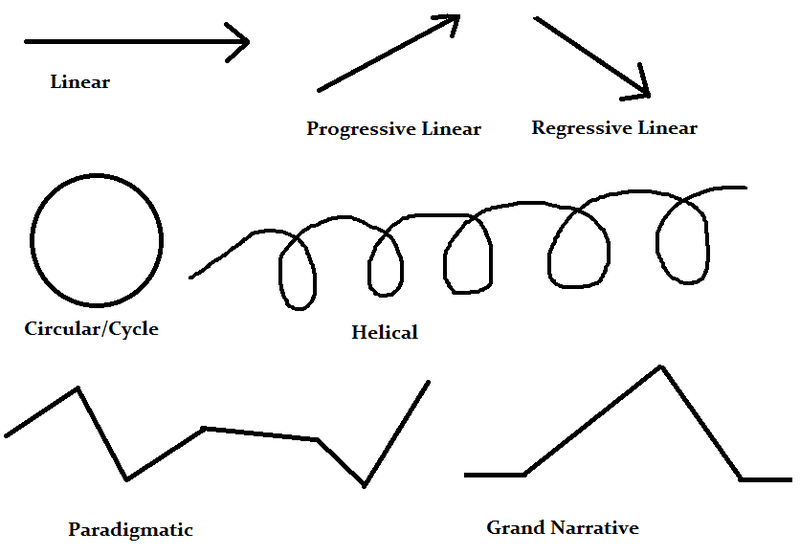 A traditional Marxist view of History sees class struggle in cycles but with the inevitability of progress. 4. Another view could be the paradigmatic view. That is that things trend in one direction until a game-changing event occurs and history goes in a new direction. In Christian circles, events like Pentecost, the Edict of Milan, and the 95 Theses might be seen as events that set in motion a new paradigm. Similar to this is the view of history as a series of eras. 5. Grand narrative. Some can see history as part of a grand narrative or unifying story. Within Christian circles, the eschatological history would fit into this. Paradise – Paradise lost – Building of conflict and tension leading to the climax of Christ’s resurrection- Working out of the resolution – Paradise Restored. However, other groups can have their own grand narratives. Muslims have one, as well as Marxists. 7. Man versus Machine. Some hold to the “Great men” theory of history. Individuals come along and change the world. At the other extreme, history can be seen as the result of sociological processes outside of the control of individual people. An extreme of this would be the Foundation series by Isaac Asimov. There are more, but this seems like a fine place to stop. The question is, does one’s historical perspective affect one’s mission work? I believe so. Missions in the early 20th century was influenced by a post-milleniallist doctrine that was linked strongly to a progressivist linear, even triumphalistic, view of history. The world is getting better and better, and we are civilizing and Christianizing the world to let others enjoy the benefits of this progress. As we know, World Wars I and II, the Great Depression, and “The Bomb” (among other things) dampened this view. Civilizing the populace no longer seemed like such an important part of mission work. I was raised in a church that tended to see history in a regressivist linear manner (with a Christian grand narrative overlaying it). The world is falling apart and getting worse and worse. This will continue until things get so bad that Christ must come and restore Paradise. If the ship is doomed to sink, there is no point in trying to plug holes and fix the engine. The only thing worth doing is getting people into the lifeboats. Social ministry, sadly, is often hurt by a regressive linear view. Some branches of Christianity focus on great personages… whether they be popes, saints, apostles, healers, or televangelists. Assuming that “great men” are the ones that get things done and create change, how might that affect how these groups do missions? These are just a few examples, but which is the best viewpoint? I have been told that the linear view of history is “the Christian view.” But is it? The Bible is full of emphasis on cycles. Perhaps focus on eschatological history is the most Christian, but there is the risk of making the time we live in as unimportant… just filler until Christ returns. I have read Christian church history and Christian missions history viewed paradigmatically… but is that more accurate, or over-simplified? Perhaps many views of history are important, and may be consistent with Christian thought. Finally, what do missionaries do when they meet people from other cultures with a different view of history. American missionaries are often progressivists… optimists. Many cultures are not so. Does having a different view of history from respondents adversely affect one’s mission work? Must missionaries convert the local culture to their historical perspective? Does a missionary need to change his/her historical viewpoint (or at least act like it) to be effective? Good questions, I think… but few answers, from me at least. I think the long view may be linear, with believers living with a creation ethic, a sensitivity and respect for other cultures and the ultimate goal of seeing the nations brought to the living God through faith in Jesus the Messiah. Thus we participate in the primary mission of God to evangelize the nations, restore Eden and enjoy the new heavens and earth promised in scripture while worshiping the risen Lord Jesus. If this sounds a bit like Christopher Wright’s book “The Mission of God” it is because he seems to have some very good insights and biblical foundations for what he writes.